A few weeks ago, I was speaking with a friend of mine who teaches in another school board. (We both teach en français, but I teach with the francophone board, whereas she is teaching French immersion with an anglophone board). 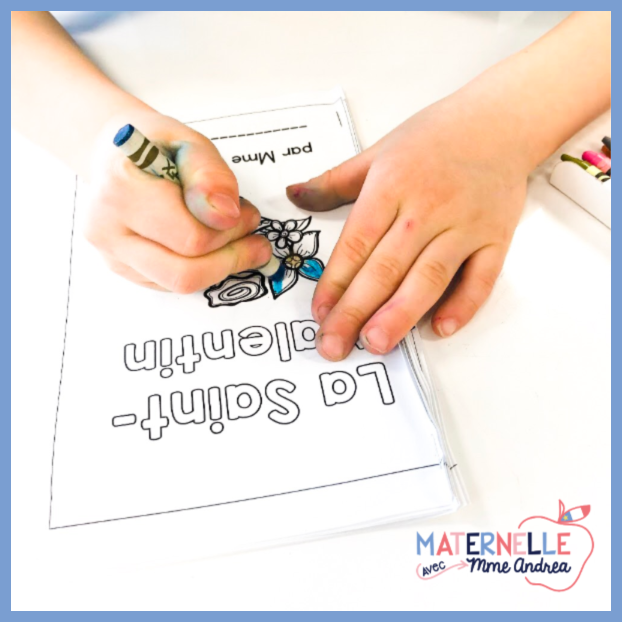 We both teach maternelle, and so we experience many of the same experiences and frustrations. Even though my students have French heritage, most of them do not speak French at home, so it can be challenging for them to reach our expectations and outcomes. Our outcomes assume that they DO speak French, and fluently. One difficulty my friend and I both share is that even though lots of our students can't really speak French yet, we are still expected to teach them how to read. You can't read if you can't speak! It feels so silly to me that we are expecting our students to LEARN TO READ (aka use all THREE types of clues - visual, structure, and sense) when they can't even speak yet. How is that fair to our students?!?! If a student can't speak, they can't use the structure or the sense to help them read. They can use the visual, sure... but how frustrating must it be for our students to try and decode a word like "hippocampe" based solely on the visual clues, when in English (or their first language), they could simply look at the picture and know the unknown word must be "seahorse"? Teach them to "read" we must, and we do, but ouf! - what a unique challenge for us, eh? Before we can get these students to successfully read even a simple level one book, they will need to practice the sentence structure AND the vocabulary over and over and over again. Since my friend and I were sharing the same frustrations, I assume it is not a challenge unique to us. I thought you might be looking for some tips and tricks to help with this, too. 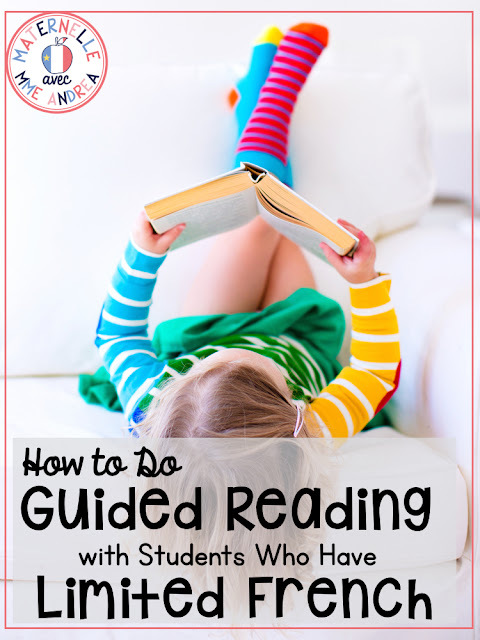 So, read on for some of my tips & tricks for doing guided reading with these students who aren't yet speaking much French. I practice the sentence structures & vocabulary I want my new language-learners to acquire as much as I can in as many different ways as I can as a whole class. We read them, we write them, we sing them, we clap them, we tap them... as many different ways as we can! This benefits everyone. My students who are stronger speakers still benefit from the repeated exposure, and their brains can focus on other things that they are ready for (like beginning/middle/ending sounds or correct letter formation when writing). Then, I can reuse those sentence structures and vocabulary words with my language-learners in their small groups. For example, I use my phrases fantastiques resource whole-group, and, as a class, we practice the target sentence and seasonal vocabulary over and over. We say it, we read it, we write it, we talk about it with a partner. ALL of my students are getting important exposure to sentence structure, vocabulary, sentence features, and more... and I can use these sentences later on with my small groups, too. With my small groups of students who can't speak a lot of French yet, we work on the sentence structure à l'oral a LOT before we even open a book. Before we even start trying to read a sentence, I make sure every student in my group can correctly say the sentence. I use jetons (Bingo chips) to help us with this. 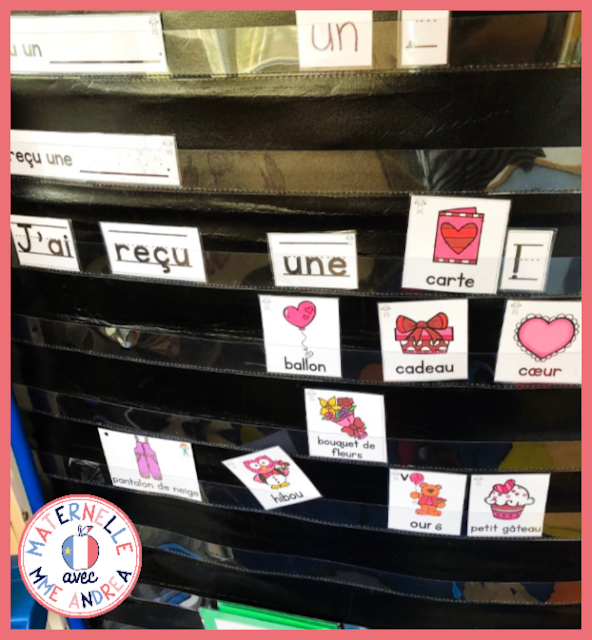 We use one jeton for each of the words I want them to practice saying to get the structure down pat, and then a card from my mur de mots cards to finish the sentence. So, for example, if we were working on saying "J'ai reçu un(e) _____", I would place a jeton on the table for each of the words "j'ai", "reçu", and "un(e)", and then I would place the vocabulary card at the end. Each student has to repeat the sentence, touching the correct jeton for each word they say. If they run the words together or forget one, they start over. This helps them think about each individual word and how they work together to form the sentence. We do this over and over, but I switch out the final word once everyone gets it. Every student has to get it down pat before I change the word! This helps my students learn each individual word that makes up the sentence, and helps avoid them mumbling all of the words into one big word. This also helps a lot with proper pronunciation and annunciation. But, they aren't thrown off by trying to decode any of the words - they are relying on their memories. After we are all warmed up and my students have mastered the target sentence structure, I give them a book with the exact structure and vocabulary words we have been working on. In this case, we have been working on "J'ai reçu un(e) ______" for Valentine's Day. Most times, I use the exact books that come in my phrase fantastiques sets. It's so easy because we have been working on that exact sentence structure as a class, and I don't have to reinvent the wheel or create anything new. The book is already written - I just print, cut, & staple as many copies as I need! I don't give these books to every student in my class. Many of my students are reading at level 3-4 by this point in the year, so these books wouldn't super help them learn. But, my students who don't have enough vocabulary knowledge or sentence structure knowledge and aren't ready for "real" level one books benefit a LOT from these little paper books! 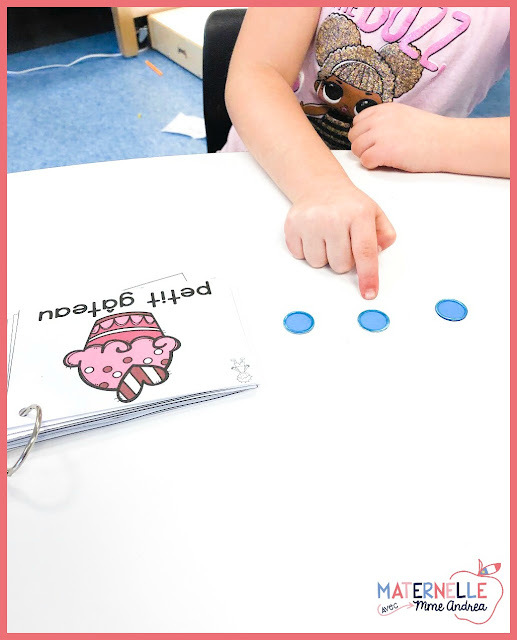 Since they already have the structure and vocabulary words down pat, they are able to work on other important reading concepts, like 1:1 correspondence, directionality, starting to recognize certain sight words, etc. My students enjoy colouring them with my special sparkly crayons, so I do give them 5 mins to colour as much as they can. Our group time is limited or I would love to give them more time to colour the whole thing, but we work with what we have! If you are interested in giving this a go with your students who can't yet speak much French, I do highly recommend it. It's important to give ALL of our students books at their level, even if we have students who can't read your "real" level one books yet. With a little extra scaffolding and practice, even your students who know barely any French can find success with books that practice the same sentence structures and vocabulary words you are working on as a class. You can easily make little mini books out of whichever sentences and vocabulary your class is working on right now. I use Keynote to make mine, but PowerPoint is also great if you don't have a Mac. And, if you don't want to recreate the wheel yourself, no worries! I have phrases fantastiques sets for TONS of themes available in my TPT store, and they all come with a variety of sentences to work on. Each set also includes two mini books, featuring two of the target sentences and lots of vocabulary words. In this blog post, I have shown one of the sentences from the Valentine's Day set. >>> You can see it right here on TPT. If you are looking to save some $$, you can also grab ALL of my phrases fantastiques sets in one big bundle! >>> Click HERE to see the bundle on TPT. I also showed my Valentine's Day word wall cards in this post. You can use the cards from the phrases fantastiques sets if you prefer, but the Valentine's Day word wall cards are a FREEBIE in my French Resource Library. You can find them in the holidays/seasonal section. If you aren't a member of the library yet, don't worry - it's super easy to join! You can CLICK HERE or enter your info in the boxes below and click the pink button. I'll send you the password via email right away!